I slutten av august 2013 arrangerte vi en konkurranse hvor du kunne sende inn spørsmål til den profilerte veganeren Colleen Patrick-Goudreau. Nå har vi fått svar! Colleen Patrick-Goudreau is an American writer, activist, public speaker and cooking instructor. 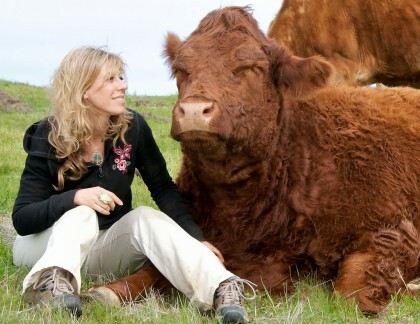 Having earned a master’s degree in English Literature, she uses her writing and communication skills to advocate veganism as a means by which to prevent cruelty to animals. An inspiring speaker and prolific writer, Colleen is the author of several very popular books, including The Joy of Vegan Baking, which won VegNews magazine’s “Cookbook of the Year” Award, The Vegan Table, Color Me Vegan, The Vegan’s Daily Companion and On Being Vegan. 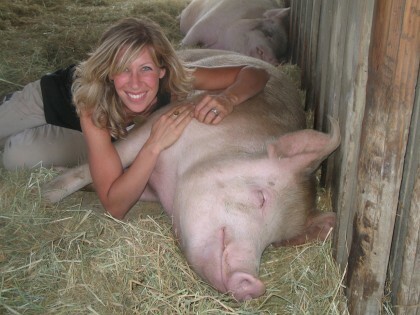 Colleen is also the driving force behind the multimedia online program “30-Day Vegan Challenge” and known for her popular podcast “Vegetarian Food for Thought”. Which strategies do you think are the best for spreading veganism, and which are the worst? Colleen: I honestly think that the best strategies for each individual really have to do with that individual. I think the people who are going to be the best at different forms of advocacy are those who are naturally suited to those different forms. There’s room for all different kinds of action and people are going to respond differently to different kinds of advocacy. What advocates need to figure out when they are deciding how best to serve is what their skills are and where their passions lie. So, for example, if someone really likes writing, they can write letters to the newspaper editor, or articles, or books. If someone likes legislating, they can get involved in that. If someone likes talking to people they can get into communication – perhaps by teaching. If someone loves cooking, food is always a great way to get into a conversation. I really think the best forms are those that are suited to each individual and I don’t think there’s a ‘better’ or a ‘worse’ in terms of advocacy. I think there’s room for all kinds of approaches – whether by groups or individuals. It’s up to each of us to figure out what we’re best at because that’s where we’re going to be most effective and the happiest. Because then, of course, they’re doing something they love. I often hear about vegans who are tired of getting asked the same questions all the time, like “where do you get your protein”, and so on. In my case, it’s quite the opposite, I really want to talk about veganism and share what I know, but almost no one asks or seems to want to know. How can I strike a balance between my need to tell people about veganism and not being too intrusive? Colleen: In every way, I try to make this topic come up every time I talk to someone. One way this comes up naturally for me is any time I am asked ‘What do you do for a living?’ And everybody tends to ask that question of one another. I am able to say ‘I’m a vegan advocate’ and ‘I’m an animal advocate’ or ‘I’m a vegan author’ and that immediately strikes up a conversation. But I don’t think that you have to do this for a living to be able to answer that question. So, for instance, let’s say you make your living as an accountant but your heart and your passion is in animal or vegan advocacy. When you are asked, you can say ‘Well, I’m an accountant by day but my real work in this world is vegan advocacy’. And then the person will ask ‘What does that mean?’ and a seed is planted, a conversation starts. So for me, at every opportunity, I find a way for this topic (veganism, animal protection, violence against animals, etc.) to come up but guide it so that it seems that the other person is the one bringing up the topic. I think it’s a matter of listening closely to the other person and leveraging what they say to create a conversation where the topic naturally turns to veganism. That’s what I do: it takes careful listening and being really light and playful with the person as well – because there is a way to bring it up in every conversation. Hunting is pretty common in Norway. Very few large predators, like wolves and bears, exist in the wilds now, having been almost killed to extinction. As a result, large animals like deer and moose have no natural enemies. One response I often get from hunters is “But there’ll be overpopulation, mass starvation and suffering for the moose if we humans don’t kill a certain percentage of them every year”. How would you deal with that response? So, in effect, I ask them directly if that’s why they do it and then I start to dig deeper and ask what it was like when they first started hunting. I find out what they were told and how it felt to them. Because what I am trying to get to is the point that hunters – every hunter in every part of the world – has been desensitized to their compassion for the animals. But because they don’t want to be looked at as someone who’s violent, they couch their killing in compassion. So I get back to the heart of what I think is the issue: they have become desensitized and they have swallowed the myths their fathers told them about hunting and killing animals. I always try to have a dialogue with them to understand it better, to get to the core of the issue (compassion vs. violence) and then go from there. Dear Colleen. I’ve been a vegetarian for many years and recently became vegan. During my time as veg*, I have to my dismay seemingly never inspired a single person to become veg* themselves, not even to reduce their meat intake. My strategy has been to be a positive role model, invite to dinners and so forth. Everybody loves the food, nobody goes veg*. How can I a) better my strategies to get people to open their eyes to veganism, and b) not be too disappointed if it fails? Colleen: This goes back to my baseline when I’m advocating: my ‘intention.’ My intention is not to make anyone do anything or change their minds. My intention is to plant seeds. For me, I always try to stay clear about my intention in this work, which is to raise awareness about the suffering of the animals, speak my truth, and be a voice for animals. With that as my intention, I can’t fail, because I set out only to provide the information and to tell my story. Of course, if our intention is to make someone vegan, the possibility for failure is there. And of course disappointment will follow! So my recommendation is to relax, take a breath, and get clear about both your intention and the realistic possibilities of any encounter. Continue to be a positive role model but switch it in your mind from ‘I’m trying to get people to go vegan’ to ‘I’m just trying to raise awareness about the suffering of animals and to share fabulous vegan food.’ You can’t fail when those are your intentions. If someone asks you why you don’t consume dairy products, and you must answer in 30 seconds or less, what would you say? Colleen: I don’t drink milk because it doesn’t make sense to go through an animal to get to the nutrients that the animals get because they eat plants. We need to skip the middle animals. We have no physiological need for any animal’s milk – including our own (beyond adulthood). We don’t drink our own milk into adulthood so why would we drink the milk of another species? Especially as the offspring of that species wouldn’t drink the milk into adulthood – even if they were allowed to! There was a time when I drank animal’s milk because I believe that there was some ‘retirement spa’ for used-up cows, but then I found out how wrong I was. When I found out that I was contributing to the exploitation and loss of millions of females, I stopped participating in it. The Norwegian Vegan Society would like to officially thank Colleen for finding time in her very busy schedule to answer these questions. Guide til et vellykket vegansk julebord!